We have completed renovating the interior to ensure your stay is "home away from home". The outside keeps improving as we continue to work on the landscaping. Five of the six bedrooms have Queen beds. Bedroom 2 has two single beds that can be zipped together to make a Super King. Let me know if you would like the beds zipped together when you book. We also have a PortaCot for use and no extra charge for under twos :-). Please be aware that the balcony outside does not have a barrier and there are steps that you will want to ensure your baby doesn't go down. There is a short private path leading to the entrance then 24 steps take you to the front door. We have one car park on our car deck you are welcome to use. We may be able to help out with one other vehicle too. Parking on the street is also an option. Please let us know how many vehicles you will have so we can make appropriate arrangements. Staying at OB Retreat will definitely add the WOW to your Wellington experience. To quote a couple of our guests..."The OB Retreat is superb. It's close enough to town to walk to dinner yet far enough away to be in a quiet seaside suburb. It's well appointed, the beds are comfy and the view is so good you can while away plenty of time watching the boats and breeze. The street is typical of many in Wellington, steepish and narrow, and then there are about 20 steps from the lane way to the house. Our sprightly 92 year old aunt stayed with us and had no trouble getting about." We were in Wellington for our daughter's wedding and had 7 people staying most nights. OB Retreat was more than big enough for all of us. The bedrooms are located well enough away from the living areas to afford a quiet retreat if needed. I've stayed all around the world and OB Retreat has topped the lot! We welcome up to twelve guests. Please show correct # of quests when you book. Base price covers 1st 4 guests. More than 4 incur extra costs p/p p/night. If you are group of 6+ and are interested in staying for more than one night you are welcome to contact us for a quote. Should your group increase after the booking is made the additional guest costs will need to be paid on arrival. We would like you to treat OB Retreat in a way we would welcome you back. Absolutely no smoking on property. We have parking available on our card deck for one car. Loved our stay at Carolyn’s beautiful Oriental Bay house. The perfect base for going to a wedding on the waterfront. It had everything we needed and Carolyn was welcoming and on hand with any questions we had. Close to the city and spacious home ideal for our large group. Great views of Wellington harbour. This property is in great position, walking distance to the city but quiet area of Oriental Bay. Great views from living and dining room. There are 6 bedrooms and 2 bathrooms giving us all privacy. Very quiet at night. The walk up to the property is steep and there are also steps. Excellent house for a group & fantastic location! Large, comfortable, warm house - perfect for our extended family get together. 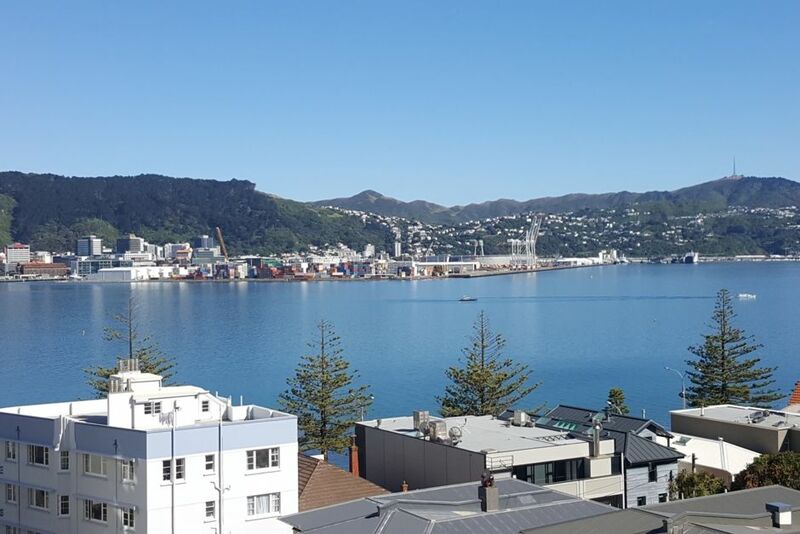 Location is superb - close enough to the city for the older generation to stroll into town and perfect for the teenagers to drop down onto Oriental Parade for a quick skate board into town. Carolyn was helpful and friendly. Wonderful house for large group, stunning views of the bay by day and the twinkle of lights by night. Perfect for our WOW weekend. Great spot and ideal for larger groups.... gorgeous view of the busy harbour!